Very soluble in water. Solution is bluish-red. Dilute solutions are strongly fluorescent. As a dye, especially for paper; as a reagent for antimony, bismuth, cobalt, niobium, gold, manganese, mercury, molybdenum, tantalum, thallium, tungsten; as biological stain. Provisionally listed for use in drugs and cosmetics. Green crystals or reddish-violet powder. Used as a dye, especially for paper, as a metal chelating reagent, and in drugs and cosmetics. 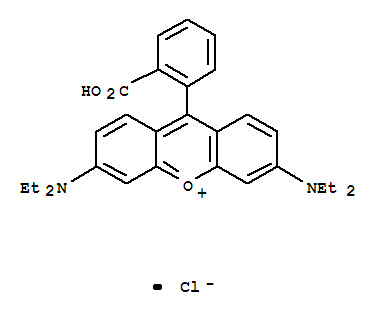 ChEBI: An organic chloride salt having N-[9-(2-carboxyphenyl)-6-(diethylamino)-3H-xanthen-3-ylidene]-N-ethylethanaminium as the counterion. An amphoteric dye commonly used as a fluorochrome. Acidic organic/inorganic salts, such as Rhodamine B, are generally soluble in water. The resulting solutions contain moderate concentrations of hydrogen ions and have pH's of less than 7.0. They react as acids to neutralize bases. These neutralizations generate heat, but less or far less than is generated by neutralization of inorganic acids, inorganic oxoacids, and carboxylic acid. They usually do not react as either oxidizing agents or reducing agents but such behavior is not impossible. Many of these compounds catalyze organic reactions. A useful fluorochrome for histology, FRET and mitochondrial probe.